Freeport, Grand Bahama: A contingency from Grand Bahama inclusive of representatives from the Bahamas Ministry of Tourism (Grand Bahama), Grand Bahama Island Tourism Board and Immerse Bahama recently met with The Bahamas National Festival Commission (BNFC) to discuss Grand Bahama’s participation in the 2015 Bahamas Junkanoo Carnival scheduled for May 7th – 9th 2015. Mega events are proposed for Grand Bahama for the weekend of April 17th – 18th 2015, with other events leading up to the main events in Nassau in May 2015. Following the visit to Nassau, Junkanoo Leaders Percy ‘Vola’ Francis and Quinton ‘Barabbas’ Woodside, came to Grand Bahama to present prototypes of Carnival Costumes to an audience of Junkanoo leaders, local artisans, makeup artists and interested persons, at a meeting held at Pelican Bay Resort on Wednesday, October 1st. The vibrant costumes were worn by models from Grand Bahama and the designs presented depicted the azure blue waters of The Bahamas, a sunshine goddess and an indigenous Bahamian male called “The Lucayan Prince”. Costume Instructors Percy ‘Vola’ Francis Quinton ‘Barabbas’ Woodside emphasized the difference between materials used to produce Junkanoo costumes and Carnival costumes. The Bahamas National Festival Commission plans to host a week long workshop on Costume Design and Construction in Grand Bahama to introduce the methodology in costume making and use of local materials. Marketing Coordinator for BNFC Samia Donaldson showed a video of the recent “Road Fever Costume Expo” which was held at The Melia Resort in Nassau on September 27th. The expo showcased the costume designs of more than twenty five Road Fever companies that have already registered for the 2015 Carnival. 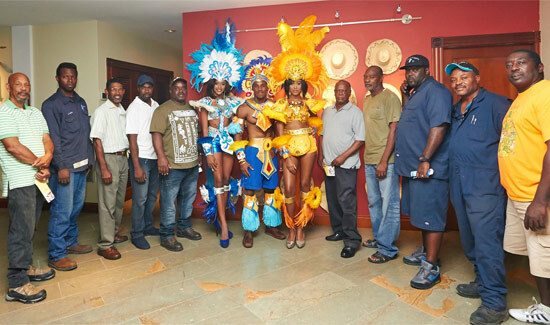 BNFC with Team GB – Grand Bahama Representatives Attend Bahamas Junkanoo Carnival Meeting at SuperClubs Breezes in Nassau. 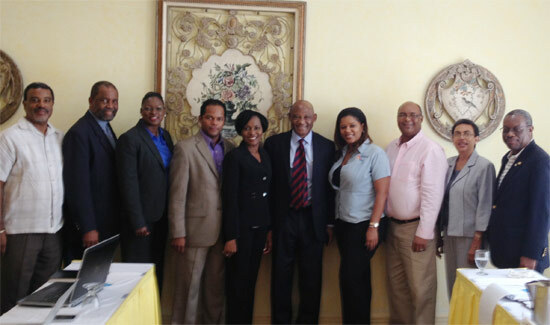 Pictured L-R: Craig Woods, Bahamas Ministry of Tourism; Percy ‘Vola’ Francis; Carmel Churchill, Grand Bahama Island Tourism Board; Nouvolari Chotoosingh; Bahamas Ministry of Tourism (Grand Bahama Island); Ginger Moxey, President and CEO, Immerse Bahamas; Paul Major, Chairman, BNFC; Sanique Culmer, Bahamas Ministry of Tourism (Grand Bahama Island); Roscoe Dames, CEO, BNFC; Arlene Nash Ferguson, Administrator, BNFC; Felix Stubbs, Co-Chairman, BNFC. when is Junkanoo in Freeport 2015?